Today is Houdini's other birthday. While we now know the great magician was born on March 24, 1874, Houdini himself always claimed his date of birth as April 6. In fact, it's possible Houdini didn't even know his real birthday. Re the Birthdays, I shall celebrate mine? always APRIL 6th. It hurts me to think I cant talk it over with Darling Mother as SHE always wrote me on April 6th, that will be my adopted birthdate. 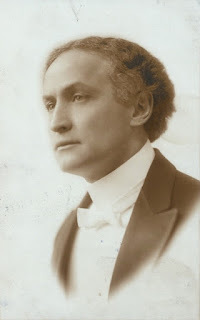 April 6 remained Houdini "official" birthday until the late 1950s when the evidence of his birth certificate (discovered in 1932) become wildly disseminated, and William Lindsay Gresham marked March 24 as his true birthday in his seminal biography, Houdini: The Man Who Walked Through Walls . Today the date has become firmly established, and April 6 has largely faded from history. I found it interesting that there was evidence that at least by 1910, both Bess and Harry knew what his real birthdate was but he kept up with the April 6 one anyway. And I think you're right about why too. You still come across the odd reference to the birthday being April 6. I guess not everyone got the memo. This is a good picture of him. I noticed the AP has posted a "This Day in History" video that pegs HH's birthday as today. How does one even make this mistake anymore? Time to update those files, AP. Official website for "Houdini House"